Der Artikel Vaclav Gunther Jacob (1685-1734): Missa Dei Filii (1725) wurde in den Warenkorb gelegt. Im 18. Jahrhundert zählte Prag zu den bedeutendsten musikalischen Zentren Europas. Hier verschmolzen Einflüsse aus Dresden, Wien und Italien mit der böhmischen Volkskultur. Das vielgestaltige musikalische Leben der Stadt in dieser Epoche zu erforschen, ist Ziel der neuen Serie »Music from Eighteenth-Century Prague« des Labels Supraphon. Eröffnet wird die Serie mit der Weltersteinspielung der »Missa Dei Filii« von Václav Gunther Jacob (1684–1735), einem der populärsten Komponisten Böhmens im ersten Drittel des 18. Jahrhunderts. Zahlreiche Drucke in ganz Europa belegen seine Bekanntheit auch außerhalb seiner Heimat. Die hier eingespielte Messe zeigt einen Komponisten von stilistisch höchster Qualität. Throughout the 18th century, Prague was a significant European centre. When it comes to music, it fused in a singular manner influences primarily from Dresden, Vienna and Italy with the famous Czech musicality and folk culture. 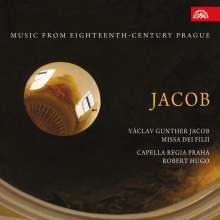 In a superlative and historically knowledgeable interpretation, the newly originating cycle »Music from Eighteen-Century Prague« will map the-yet-to-be-appreciated wealth which is still being discovered in Prague, Czech and foreign archives and which directly reflects the variegated picture of the musical life of the capital. Vaclav Gunther Jacob's »Missa Dei Filii«, which in world premiere opens this series, is an example of the creation of one of the most popular composers from the Czech lands in the first third of the 18th century. Jacob was primarily synonymous with the Benedictine Monastery of Saint Nicholas in Prague's Old Town, yet thanks to several printed music collections his fame spread far beyond the country's borders (prints have been preserved in, for example, Munich and Bologna) and earned him a number of commissions from abroad. Through this CD, the remarkable work of the stylistically highly original composer has for the first time in centuries the opportunity to draw the attention it deserves and be listened to by lovers of Baroque music. The recording is noteworthy for its vivacity and stylistic purity – attributes characteristic of Capella Regia Praha. 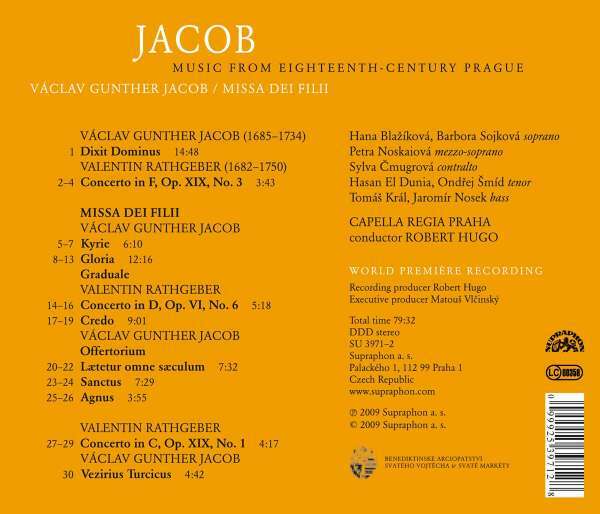 The world premiere of V. G. Jacob's Baroque mass opens the new edition series Music from Eighteen-Century Prague.